An elephant approaches a helicopter in Samburu game reserve on September 15, 2015. As elephant poaching in Africa by organised crime gangs using high-tech equipment rises, those working to stop their extinction in the wild have turned to technology too. 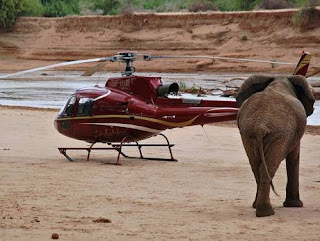 SAMBURU, Kenya: As elephant poaching in Africa by organised crime gangs using high-tech equipment rises, those working to stop their extinction in the wild have turned to technology too. But the decade-long collaboration between the conservationists and Google has meant that, at least in this small corner of Kenya, poaching is at last on the decline. The mapping technology is protected from would-be poachers with tough security measures. “We’re able to use the tracking technology overlaid on Google Earth — and hence understand their migration patterns, and therefore build better protection around that,” said Farzana Khubchandani of Google. Kenya is struggling to stem poaching to protect its remaining elephant population — currently estimated at 30,000 — and just over a thousand rhinos. Samburu, some 300 kilometres (185 miles) north of the capital Nairobi, is home to around 900 elephants. But conflict between elephant and man is increasingly common, with livestock encroaching onto the park as drought bites. “In the long term, it allows better planning to establish corridors for the animals — areas often extremely vulnerable to human development,” he added. The technology is not cheap: each collar costs some $8,000 (Dh29,384) to buy, fit and maintain. Complementing the maps, researchers track the complex elephant family trees, recording every animal with long registration numbers. But on the ground, efforts to protect the elephants are also deeply emotional for the conservationists. “There’s Rodin, and Matisse — but Gauguin sadly died,” adds the 73-year old British zoologist, naming each of the 23 animals grazing among the bushes lining the Ewaso Ng’iro river, a lifeline snaking through the 165 square kilometre (65 square mile) reserve. But old tracking systems remain: outside the research centre in Samburu, long sad lines of dozens of elephant jaws are laid out, all killed by poachers or drought, the teeth of each providing valuable data as to their age at death. “Here was one bullet, here another,” said Daballen, lifting a bleached shoulder bone, belonging to an elephant called Ebony. Those gunshots did not in fact kill Ebony, finally felled in May 2011 by a bullet to the head. “We’re doing all we can, but the poachers are not going away,” he added, waving at the lines of bones. Cairo: Unidentified assailants gunned down an Egyptian police general on the street in the Sinai Peninsula stronghold of Daesh on Saturday, the interior ministry said. General Ahmad Abdul Satar was the second senior police officer in three days to be killed in the North Sinai provincial capital Al Arish. On Wednesday evening, assailants killed General Khaled Kamal Osman as he inspected a police unit in a drive-by shooting claimed by an Egyptian affiliate of Daesh. The security forces have struggled to suppress an insurgency in the peninsula since the army overthrew Islamist president Mohamed Mursi in 2013. Cairo says militants have killed hundreds of police and soldiers, many in attacks claimed by Daesh. The militants say their campaign is in response to a crackdown by the authorities since Mursi’s ouster that has left at least 1,400 people dead and thousands jailed. The military launched a major operation earlier this month to root out militants in the Sinai and says it has killed more than 200 - a toll that it was not possible to verify. Beirut: A batch of 75 rebels newly trained by US and coalition forces in Turkey to fight terrorists have entered northern Syria, a monitoring group told AFP on Sunday. “Seventy-five new fighters trained in a camp near the Turkish capital entered Aleppo province between Friday night and Saturday morning,” said Rami Abdul Rahman, director of the Syrian Observatory for Human Rights. He said the group had entered in a convoy of a dozen cars with light weapons and ammunition, under air cover from the US-led coalition that has been carrying out air strikes against Daesh in Syria and Iraq. The fighters then deployed to support two US-backed units, with most assigned to Division 30 - the main unit for US-trained fighters - and others to a group called Suqur Al Jabal (Falcons of the Mountain). Before the new batch of fighters, the US-led train-and-equip programme had only managed to identify and train some 60 rebels to fight Daesh on the ground. The $500 million programme run out of Turkey has been fraught with problems, with more than a dozen of those already deployed with Division 30 either dead or kidnapped.